If you are a regular reader of the blog, you’ll know that I work with Canmore Elopement Planner Something New Weddings a lot. This true elopement in Canmore was another one that Something New Weddings put together. I met up with Sarah, George & their two dogs in Canmore where their intimate ceremony was performed by Patrick Smiley overlooking the Bow River with the mountains in the distance. One of the cool things about elopements is that you have the option to pretty much do your ceremony anywhere since you don’t have to worry about guests and having to set up chairs, etc. After the brief ceremony which was presided over by the dogs, we walked the trails along the river before heading uo the mountain to Whitman’s Pond. Even though we were early in September, we were greeted to fresh snow falling and covering the trees in the distance which was stunning in photos, although unexpectedly chilly in all the wind. Sarah & George had fun together and didn’t take things too seriously! They were even willing to hop out onto a little rock (and check out Sarah’s awesome jump back to shore!). The most important photos they wanted for the day were with the dogs, so they are hanging out in quite a few of the photos. 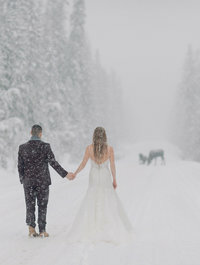 Here’s some of my favourite images from this elopement done with Canmore Elopement Planner Something New Weddings. Are you newly engaged and are planning a Canmore elopement? I would love to photograph your elopement or intimate wedding in the Canadian Rocky Mountains! 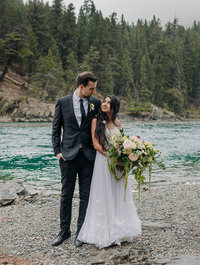 Please get in touch for more information on Banff elopement wedding packages or for other mountain wedding destinations like Canmore, Kananaskis, Emerald Lake, Lake Louise, Peyto Lake or Moraine Lake. If you aren’t looking for a Canmore elopement photographer, I also do vacation portrait sessions in the area! Looking for more Canmore elopement planner inspiration? Check out this Canmore/Kananaskis intimate wedding! 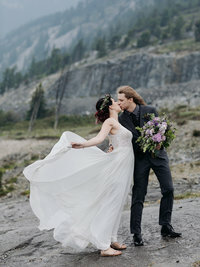 Or this Kananaskis elopement! Try this Rundleview Parkette wedding in Canmore! Or this intimate Iron Goat wedding in Canmore! Take a peek at this A Bear & Bison Inn wedding in Canmore! Or this Quarry Lake wedding in Canmore! Try this Coast Canmore Hotel wedding! Or this Cornerstone Theatre wedding in Canmore! 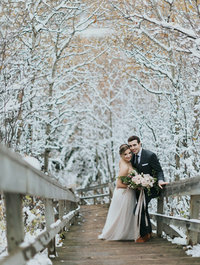 Don’t forget this Canmore Nordic Centre wedding!